I recently came across this article about Wat Pasantidhamma Buddhist temple in Isle of Wight County Virginia USA. I knew we had a namesake for the Island in the states but never thought of it's having it's own Buddhist community........ neat! Carollton, VA.(USA) -- The wet gravel crunched underfoot as worshippers walked from their cars through the parking lot of the Buddhist temple Sunday night.Milky white smoke from logs burning in metal drums hung low in the damp, cold air, carrying the scent of pine through the courtyard. 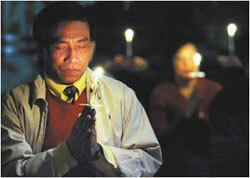 << Charus Boonrung, a member of the Wat Pasantidhamma Buddhist temple in Isle of Wight County, meditates Sunday night during a candlelight vigil for tsunami victims and survivors. At Wat Pasantidhamma, the people had gathered for a candlelight vigil to offer compassion to the victims and survivors of the tsunamis that have killed more than 160,000 people in Asia and Africa. Members of the congregation organized a simultaneous vigil with four temples in New York, Washington, Pennsylvania and New Mexico. "The people who died have died. We cannot bring them back," Phramaha Saman Methawee, one of the temple's five monks, said in an interview before the vigil. "How we respond to death is to look at our lives. Are we living the right way? Are we doing the right things?" The candlelight vigil, an American tradition, at a Buddhist temple is a symbol of Buddhism's pliability - it is an ancient philosophy that shuns materialism and encourages meditation, chanting and reflection, but its principles adapt to life in a modern, technological world. Just before 5 p.m. Sunday, more than 70 people filed past the temple office and into the worship area. Some people sat in dark wooden chairs. Others folded their legs and sat on the thick, red carpet. Some bowed to the four, giant, golden Buddha statues sitting in the lotus position on platforms before them. Tony McDaniel, a 34-year-old Thailand native who briefly served as a monk at the temple, spoke through a microphone, explaining the order of the service. Behind him, the five monks sat on a platform with their legs folded, dressed in traditional saffron robes. The most senior monk, Phramaha Udom Papunggaro, led the first chant. The rhythm of the Thai words buzzed from the monk's chest to his throat and hummed through the speakers. Afterward, McDaniel instructed the people to close their eyes and meditate. Intermittently, an older man would stand to pound the black gong hanging in the corner. The deep, hollow sound reverberated through the temple. Latecomers scrambled to find a seat some held conversations in the hallway. A few people in the temple coughed or shifted loudly in their seats. "You hear sound, but let it pass like the wind," McDaniel said. "Keep your thoughts concentrated on the idea of compassion." While a few of the visitors had difficulty meditating for 15 minutes, the monks sat silently, undistracted. It is a skill they practice daily. The temple and the monks' home sit on an unpaved portion of Chapman's Lane in Carrollton. The temple is surrounded by trees, bare in the winter, some felled by Hurricane Isabel. Standing in the courtyard, you can hear the tinkling wind chimes on the temple roof and rumbling trucks downshifting on Brewers Neck Boulevard, but you can't see anything beyond the trees. The monks rise before 5 a.m. and start their days with an hour of group meditation followed by an hour of chanting. They lead a chanting service for the public in Pali, the sacred language of Theravada Buddhism. They eat once before noon and only what visitors offer them. They are not allowed to ask for food or anything else. The monks spend most of the afternoon working. Daily, they brush the sandy ground leading to the three meditation refuges outside the temple - Buddha Land, Dhamma Land and Sangha Land, which represent the man, the teaching and the community. Last week, on a warm Thursday afternoon, they used shovels to lay a gravel path from the parking lot to their new home beside the temple. They also maintain a Web site, answer e-mail and phone calls and prepare a monthly newsletter sent to about 1,200 recipients. 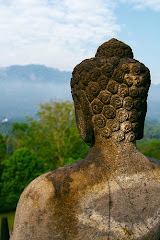 If you want to learn more about Buddhism, the monks have cassettes and CDs available as well - in English and Thai. While Saman Methawee led a tour of the temple, a cell-phone rang and vibrated deep in the folds of his robe. He continued to speak as though he didn't notice it at all. 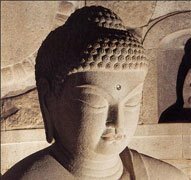 "Buddhism is not a religion. It is a way of life. You can apply it to your life," he explained about the incongruity of a monk and a cell phone. "Use technology, don't be a slave to technology. We use it to make our minds happy - to live without fear or worry." Like focusing on breathing rather than sipping air into a chest tight with frustration about an unresponsive printer or a frozen computer screen. "Hell and heaven are in our minds," Saman Methawee said. "When you think bad things, bad things happen to you. If you think good things, good things happen. The best way to take care of the future is to care for the here and now." I particularly like the way that the location is described as being "in rural Isle of Wight" ... just like us!